Found one file extension association related to Fathom and 1 file format developed specifically for use with Fathom. Developer / company: Chartwell-Yorke Ltd.
Fathom is a dynamic data and statistics software that allows users to freely and creatively explore ideas in mathematics, statistics, and science. A friendly interface and powerful capabilities of Fathom Dynamic Data Software allow you to freely and creatively explore ideas in mathematics, statistics, and science. Relate your studies to real-world examples and understand the concepts as never before! 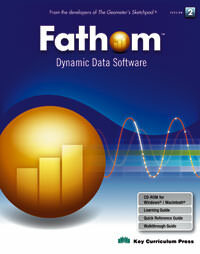 Fathom 2 enhances learning from algebra to calculus, statistics, and beyond. Get excited about data exploration! If you need more information please contact the developers of Fathom (Chartwell-Yorke Ltd.), or check out their product website.